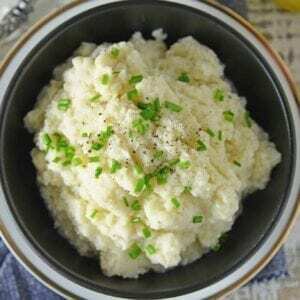 I love goat cheese recipes! I mean who doesn’t? Pairing creamy goat cheese with roasted red peppers inside of a zucchini, is a dangerously delicious combination! 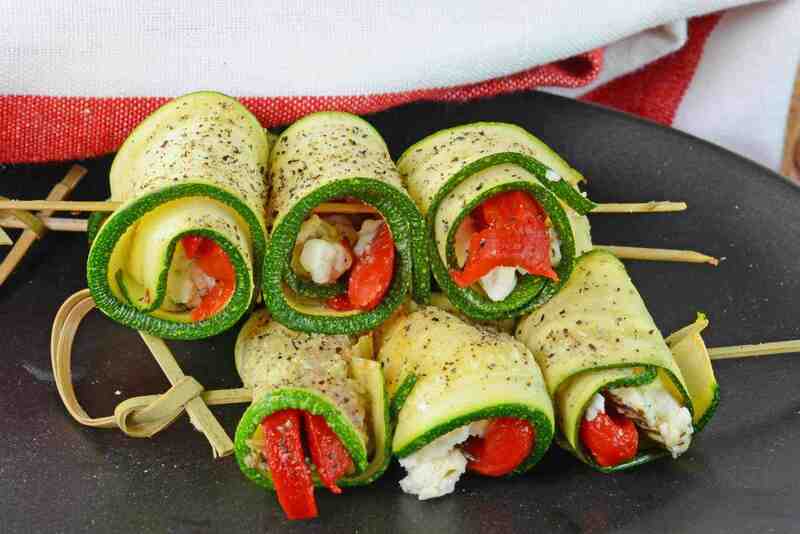 These zucchini roll ups are the perfect party recipe! 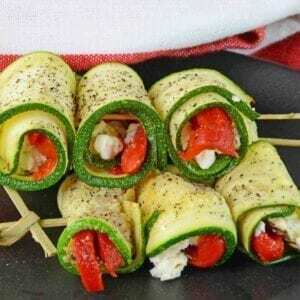 Goat Cheese Zucchini Roll Ups are a tasty toothpick appetizer made with roasted red peppers, seasonings, and creamy goat cheese, all wrapped up in thin layer of zucchini! 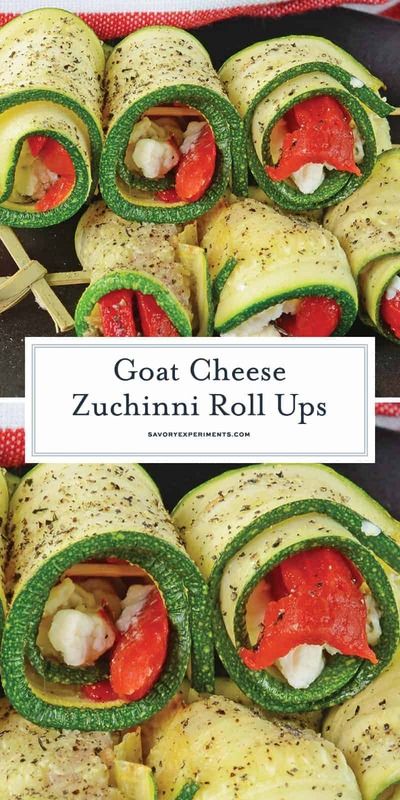 Goat cheese Zucchini Roll Ups are wonderfully delicious and rich. Moist, but crunchy zucchini with creamy, tangy goat cheese. 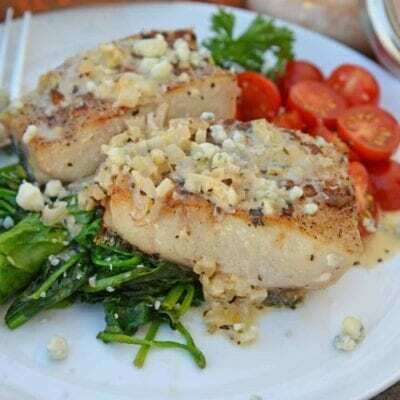 I like making them to place on a sample platter of appetizers because of their color and ease of preparation. 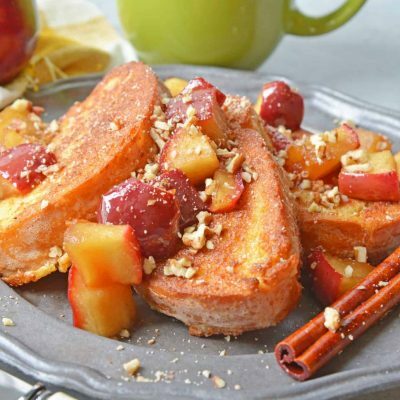 You’ll be thanking me once you see how easy these are to make and how much your guests will enjoy them! They’re honestly the perfect bite sized appetizer to serve up. All these zucchini roll ups take are a handful of ingredients, 10 minutes of prep time, and 10 minutes of cook time. 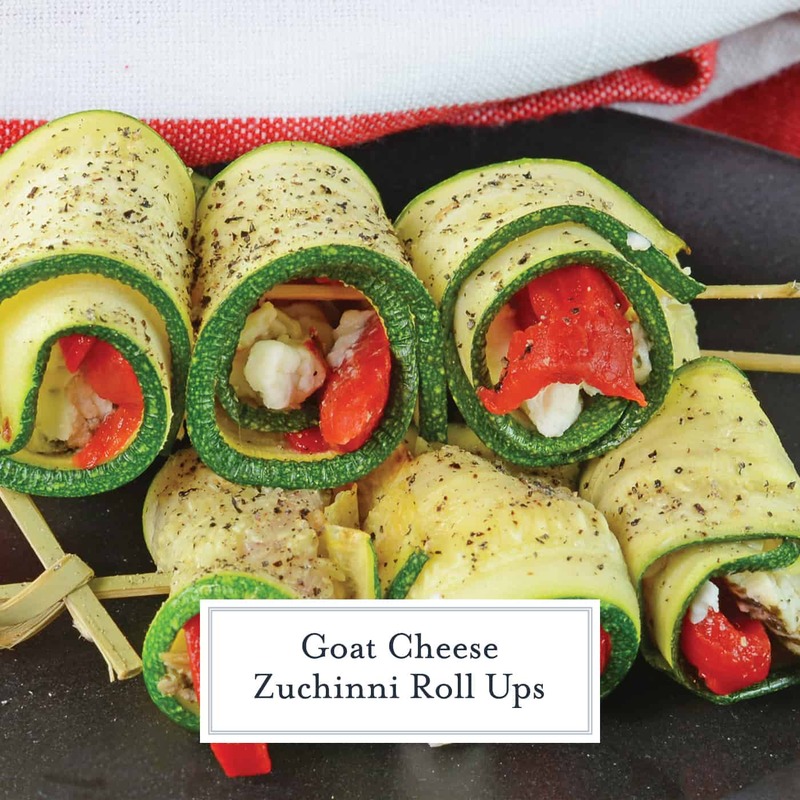 Bringing your grand total to only 2o short minutes to savor these Goat Cheese Zucchini Roll Ups! If you don’t own one, use a very sharp knife and be super careful. The zucchini slices have to be sliced and cooked just right to ensure that they will be thin enough to roll, but hardy enough to hold in the stuffing. One-bite toothpick appetizers are ideal for a variety of occasions. 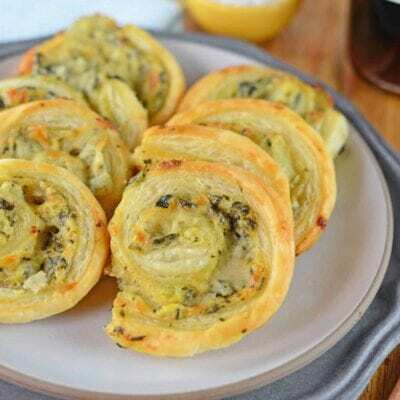 Zucchini Goat Cheese Rolls can be made year round for any parties or occasion. You can even use your leftover roll ups to chopped up and mix in a salad. 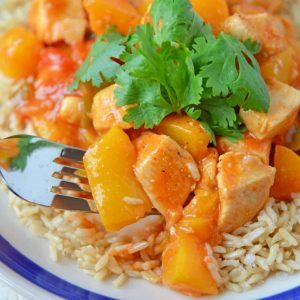 That’s if there are any leftovers to use! 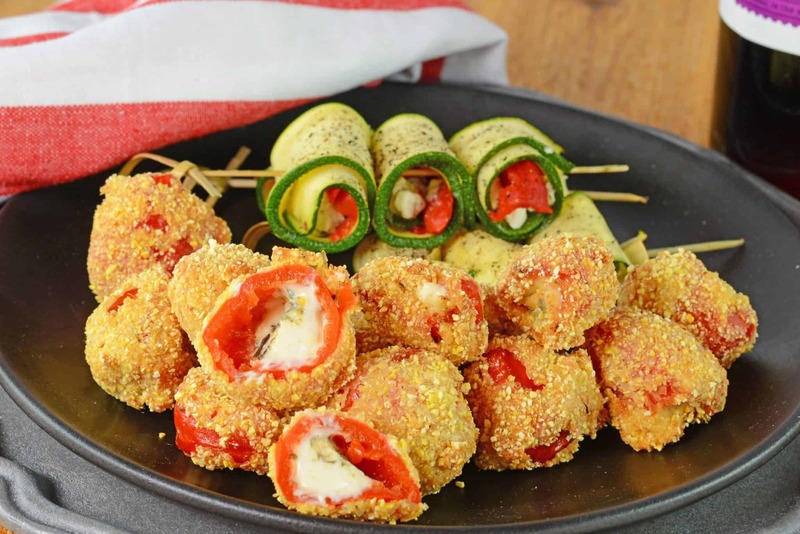 Zucchini Goat Cheese Rolls are tasty toothpick appetizers made with roasted red peppers, seasonings and creamy goat cheese. Make them ahead for an easy appetizer! Preheat oven to 400 degrees. Cover a baking sheet with aluminum foil and coat with cooking spray. This is the tricky part. Cut each zucchini lengthwise into 4 mm (a little less than 1/4 inch) wide planks using a mandolin slicer or very sharp knife. Baste tops with extra virgin olive oil. Season with salt and pepper. Bake for 10 minutes, or until soft and malleable. Zucchini will be slightly soft to the touch. Remove from the oven. Spread goat cheese down each plank and then line with roasted red pepper strips. Roll up and secure with a toothpick.